A little update from Adrian as we haven't heard from him for quite sometime. His update also covered the Maximise Your Potential Award ceremony held last year in August. This time, there will be no race updates. For the first time since 2002, I didn't take part in the StanChart Marathon because of a back injury, L5-S1 nerve impingement. With physiotherapy and chiropractic sessions, I'm recovering well from my degenerative disc condition. I put on my running shoes again in mid Dec 09 and have started my training for the Adidas Sundown Marathon in May 2010. For starters, I'm taking slow, steady steps with 5-7km runs @ 10km/hr pace, 5 times a week. Below are RunForFunds updates since Aug 2009. 2009 is a year of change for RunForFunds and its partners. Thanks for your continued concern and support of the RunForFunds movement. 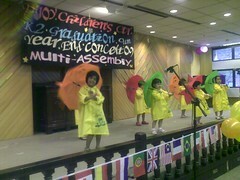 The award ceremony, hosted by teachers Jessie Soh and Theresa Thong, was held on 29th August 2009. It was attended by the parents of the students as well as supporters of RunForFunds. This year's ceremony adopted a different format. Instead of me speaking to the students and their parents (which should be as interesting as watching paint dry), I had 2 guest speakers. The aim was twofold. To educate their parents of potential financial pitfalls that could affect their quality of life. RunForFunds supporter Sheena Ho shared how she overcame financial challenges at home to pursue her tertiary education. Message to the students: Don't give up even when the going gets tough. RunForFunds SuperFriend (ie. day one supporter) JayWalk related real-life stories to the students' parents how he tried to help people break free from the abyss of gambling entrapments and how bad debts (with loan sharks) destroy lives. Message to the students' parents: Do not seek easy solutions to their financial hardships and land up in deeper ditches. The personal sharings were well received by the parents and the students who later told me that these were timely reminders as the current economic crisis posed greater challenges to their already strained financial situations. It helped them realize there is no "easy money" and that a good education is probably the best way of breaking the poverty cycle. 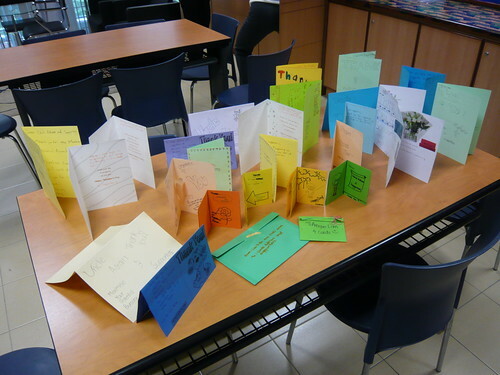 Below is a pic of the thank-you cards prepared by the students for RunForFunds supporters. Note: I apologize for not posting pics of the event. They were blur because I brought a camera that people didn't know how to use properly (neither do I actually… haha !). My fault. Miss Mabel Wee retired as principal of GMSP earlier this year. Taking over the helm of the school administration is Ms Rina Yap (Mrs Liang). In my interactions with Rina, I find her to be a principal "with a caring heart" who is committed to evoke positive changes in the lives of her students. She is extremely supportive of the RunForFunds movement and in the coming months, we'll be discussing how RunForFunds can better assist underprivileged students. An example is the some MYP students were enrolled in a school enrichment program. It is an experiential learning session: Sand castle building. The students were taught that it takes hard work to build a castle and that a firm foundation is critical. Rina invited me to speak to the students after that session and my impression was that they learnt an experiential lesson that was hard to forget. In my discussions with Rina, I expressed my desire to provide continued support for MYP kids who have graduated from GMSP. For those who moved on to GMSS (Secondary, which is just opposite the primary school), we will work out a way to extend the MYP. For your info, GMSS also changed its school principal in 2009. As for those who have gone to other schools, we'll have to figure out how to provide support in a meaningful and sustainable way. 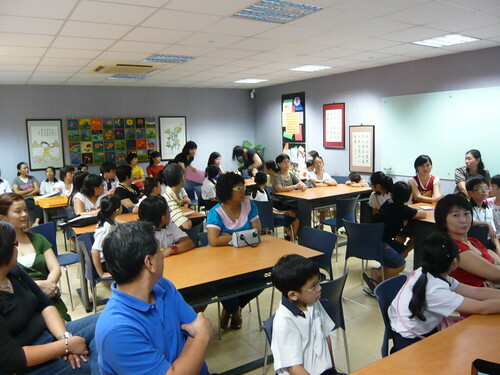 D'Joy continues to serve the children and parents in the Jalan Besar area. In its 2009 annual report, RunForFunds was mentioned. RunForFunds provided study aids and equipment + defraying costs for medical bills of a student @ D'Joy. 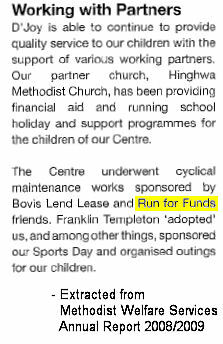 Bovis Lend Lease, led by Jerry O' Sullivan (BLL, my previous company, has several RunForFunds supporters) also provided cyclical maintenance on a pro-bono basis with RunForFunds sponsoring part of the bill. D'Joy also has a change in management in 2009. Janet Leong is now the principal of D'Joy. I will be liaising with Janet on ways to extend the partnership that RunForFunds has with D'Joy. This year, I also plan to engage BLL early in the year to see if they are prepared to chip in as well. Work at D'Joy is a labour of love as it changes the lives of children from challenging family backgrounds. 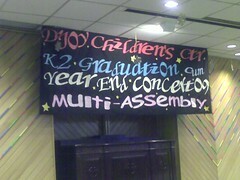 Dinah and I were invited to the graduation ceremony of the kindergarten kids. 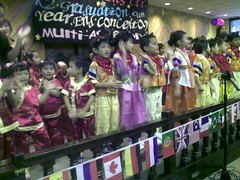 They put up a heartwarming performance for parents and teachers. 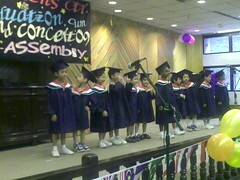 Hopefully, the lessons that they've learnt @ D'Joy will serve as firm foundations as they grow up. In 2010, RunForFunds will be looking to leverage the success at GMSP and extending it to GMSS through partnerships with both principals in one committee. We will also assess the feasibility of RunForFunds supporters mentoring some of these kids. As for D'Joy, it will continue to be an area of focus for RunForFunds. We will plug gaps where the government can't, hopefully with corporate sponsorships. So if your company wants to give back to society, please let me know.